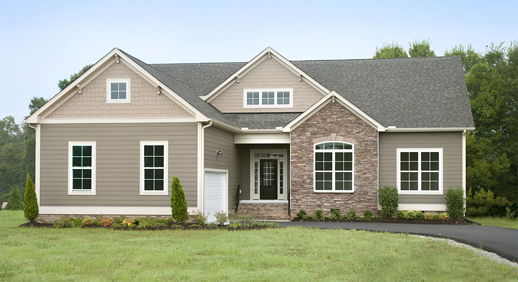 Main Street Homes is offering homes for sale in Midlothian, VA. The Treyburn III floor plan is an expanded version of Main Street Homes award winning Treyburn I. This new floor plan offers 3 bedrooms, 2 baths as well as a two-car garage with a total square footage of 3,384. The Treyburn III also features a luxurious master bedroom suite with a large walk-in closet. You and your family will spend endless hours in the beautiful kitchen and breakfast room overlooking your spacious great room with soaring 10-foot ceilings. Entertain your family and friends during the holidays or just because in the beautiful formal dining room featuring a decorative column and perfectly positioned to the kitchen. The Teyburn III has two additions first floor bedrooms that share a bathroom and includes a furnished loft, rear dormer, unfinished bedroom and attic storage. Optional features are a finished bedroom and bathroom upstairs as well as a basement. Come check out the beautiful homes for sale in Midlothian, VA and check out the Treyburn III floor plan for you and your family today. This entry was posted in Buyer Tips, Design Tips, Home Tips, Kitchen Tips, Lifestyle Tips, Main Street Homes News, Market Watch, Our Communities, Spring Tips, Tech Tips, Things to Do and tagged builder in richmond va, Business and Economy, Construction and Maintenance, custom builder richmond, new homes near richmond, richmond virgini, richmond virginia homes, Richmond Virginia Homes For Sale, virginia home builder. Bookmark the permalink.